Jana is a certified yoga teacher and therapist, meditation facilitator and Ayurvedic lifestyle consultant who specializes in the therapeutic application of yoga and meditation for seniors and the management of cancer and other acute and chronic conditions. She is director of Power of One Yoga Center, a community-based studio in Baltimore, MD, and the co-founder and Executive Director of the Black Yoga Teachers Alliance. Her exploration of yoga began in 1972, and she has been an eyewitness and advocate to the expansion of yoga and Ayurveda in the U.S., especially in communities of color. She is a certified Master Gardener in Baltimore City, who has also studied herbal medicine and energetic healing practices with indigenous teachers in Africa and Central American. 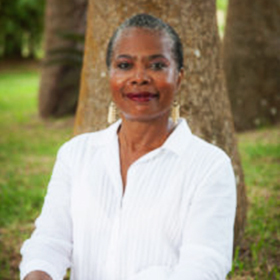 She educates individuals and communities about “earth medicine”; through the practice of urban gardening.